Dover Pullman Express leaving Victoria. Engine No. 850 “Lord Nelson”. WHAT the real name of this train is I could not say. For many years past the “Eleven o’clock” service from Victoria has been familiar to travellers all over the Continent but our train cannot rightly be called the “Eleven o’clock”, because it starts at 10.45! It is, in fact, a first portion of the 11 a.m. train, designed to give its fortunate passengers the choice of places on the boat at Dover. Sometimes it is called the “Golden Arrow”, but that name belongs to the French express that runs in connection on the other side of the Channel, and which has been previously described on this website. The rudest name that I have heard bestowed upon the 10.45 down is that of the enginemen who, in joint recognition of the beautiful cream and umber livery of the Pullmans arid the enormous weight of the train, have nicknamed it the “White Elephant”. It will be agreed that so famous a train as this needs a name of its own, and one day perhaps the Southern Railway authorities will think out some telling designation, to rank with the “Southern Belle” and the “Atlantic Coast Express”. Meanwhile it is difficult to write an article of this character in description of a train without a name! So far from being a “White Elephant” in reality, the 10.45 a.m. from Victoria is one of the best-paying trains on the line. Special fares are charged to Dover for the use of these Continental expresses and on this express not only is the accommodation restricted to first class, but a Pullman supplement of 3s. 6d. a head is charged in addition. The general arrangement in regard to Pullman cars, by the way, is that they are built and maintained by the Pullman Car Company, who pay to the railway company concerned an agreed fee for working the cars over their lines. Thus, in a case like this, the railway obtains all the first-class fares and the payment mentioned, while the owners of the cars receive the supplementary fares that are charged for their use, and the profits from this catering. As every seat on the 10.45 is not only occupied, but is generally booked in advance, you will see that this popular train can better be compared to the goose that lays golden eggs than to a white elephant! Actually you can reach Paris in the best time of the day by catching the second part of the train, which leaves Victoria at 11 a.m. On this, too, you can make a Pullman journey through to Paris, as at least four Pullmans are usually included in the formation. By catching the “Golden Arrow” at Calais you may reduce your journey time between London and Paris to 6 hours, 40 minutes. The 11 o’clock train also carries ordinary first and third class passengers, in corridor coaches that are vestibuled to the Pullman cars, so that meals and light refreshments can be served in any part of the train. At slack times, between the Continental “seasons”, a full train of Pullmans is not always required on the 10.45, and at such times some of the cars are replaced by three or four corridor coaches. But you will customarily find nine of the latest and most luxurious 8-wheeled type Pullmans, weighing 40 tons each, included in the 10.45 a.m. formation, together with one first-class brake coach, weighing 32 tons, bringing up the rear of the passenger portion. Behind that comes the accommodation for registered luggage. This is no inconsiderable item; it requires two 4-wheeled vans and two 6-wheeled trucks carrying the “luggage-boxes”. Readers will remember that these were described in the article on the “Golden Arrow”; each truck carries four sealed “boxes”, or containers, with the luggage registered through to destinations abroad, and at Dover these containers are hoisted off the trucks direct into the hold of the steamer and at Calais out on to corresponding trucks on the French railway, thereby saving a great deal of handling. The two luggage vans weigh 13 tons each, the two trucks 10 tons each, and the eight boxes about eight tons in all, making together an addition of 54 tons to the empty train weight. On the occasion of the photograph at the head of this article, by the way, owing to the departure of the French President after his State visit to London, the usual No. 2 platform was not available, so that “Lord Nelson” had to drive into No. 2 for the luggage, and then work the extra vehicles across to No. 6, where they were attached in front of the 10.45 train instead of in rear. We have now a total of 446 tons, and with passengers and their luggage we may expect the total weight of the train, behind the engine tender, to be in the neighbourhood of 470 tons. What the introduction of the “King Arthur” 4-6-0 engines has meant to these Continental services is best understood when I mention that, before their advent, the Maunsell 4-4-0 engines previously employed were not allowed to take more than 290 tons unassisted. Even when they were used in pairs, as they were on these trains, 400 tare tons was the maximum figure permitted. Now the “King Arthurs” are rated at 425 tons, without any help other than that of a bank engine up the steep incline out of Victoria. By adjustments in the Pullman stock employed, some of which weighs less than 40 tons per car, efforts are made to keep the maximum tare of the train as nearly as possible to this 425-ton figure. But if we have the good fortune to find the new 4-cylinder giant 4-6-0 “Lord Nelson” at the head of our train, the staff will not be worried if the load is well above the 425-ton mark, neither will there be any concern if there is no “banker” available to help at the start. Of this more in a moment. It must not be thought that the introduction of heavy six-coupled engines on these services over the old South Eastern and Chatham lines was merely a matter of building them and putting them in commission. There existed, when the “King Arthurs” were built, a considerable number of underline bridges on the route, many of them of considerable age, over which it would not have been safe to work such heavy engines. The Southern authorities boldly faced this problem - as they have, indeed, during recent years faced every other problem affecting the improvement of their services - and decided that every weak bridge should be strengthened. 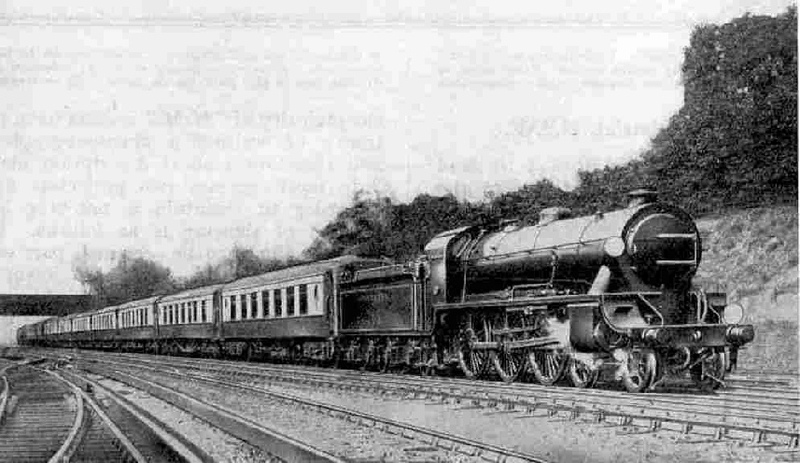 The necessary work was first carried out between Victoria and Orpington - the old South Eastern main line was better equipped in the matter of up-to-date bridgework than the old Chatham section - and this gave the 4-6-0 engines free use of the main line from Victoria to Dover via Tonbridge. Dover Pullman Express passing Sandling Junction. 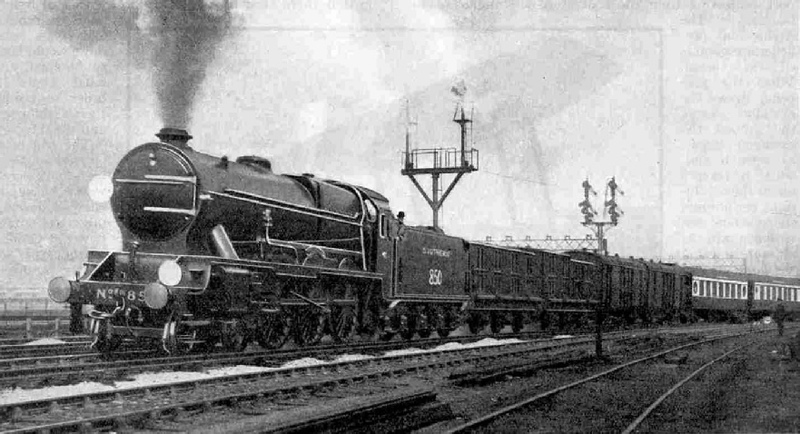 “King Arthur” 4-6-0 No. 766, “Sir Geraint”. Next the route between Swanley Junction and Ashford, via Maidstone East, was tackled, and the work on this section is now complete, so that boat expresses may be worked via Maidstone East, if so required. None of the regular down trains is booked to go by this dreadfully hilly and slack-infested route, but if the up trains miss their regular timings, owing to the late arrival of the steamers at Dover or Folkestone, they have frequently to travel up to town by the Maidstone route, in order not to upset the regular trains over the congested length of line between Tonbridge and Orpington. It should be added that, when an up regular timing is “missed” in this way, the up boat train concerned must be held in order to run by one of a number of “conditional” timings, which have been plotted through to London at times that will cause the least disturbance of the ordinary services. There is still another route to Dover, and that is the old Chatham and Dover main line, which goes by way of Chatham, Faversham and Canterbury. Weak bridges on this route are also in course of being dealt with, so that ultimately the Southern Railway will have the choice of three routes for working their increasingly important Continental services between London and Dover. Whenever possible, however, the Tonbridge route is used, as it is both the shortest and the least heavily graded, which are considerations of no small moment in the working of heavy trains like these. 4-6-0 of the previous article and the 83-ton giant of our present trip is indeed remarkable. On the basis of working steam pressure, cylinder and driving wheel dimensions, compounded into what is known as the “tractive force” formula, “Lord Nelson” is, at the moment of writing, the most powerful passenger locomotive in the country. We shall find, on our journey, that the boiler and firebox are of more than ample size to furnish all the steam required to make that tractive force effective, and that the exceptional adhesion weight of 62 tons, on the three coupled axles, will enable the maximum power developed by the engine to be transmitted to the rail without slipping. This wonderful locomotive was described at length in the article “Britain’s Most Powerful Loco”, and I shall not stay further to go over the details of his construction. But as I have had quite recently the privilege of riding to Dover on “Lord Nelson’s” footplate, on this very express, I want you to imagine that we are occupying that jealously-guarded point of vantage together, and so are able to watch the manner in which the crew handle their mighty charge. The cab is a more desirable place in which to travel, I am sure you will agree, than the most palatial of “Pullmans”. Just a word or two about Victoria Station while we are waiting for the “right-away”. Until the grouping of the railways became effective, Victoria consisted of two distinct stations side by side, the old South Eastern and Chatham terminus, from which we are about to start, on the north-east side, and the London, Brighton and South Coast on the south-west. The stations and the connecting railways across the Thames were built by a separate company - the Victoria Station and Pimlico - which leased the property to the two railways using them. Now that the Southern Railway has taken control, part of the separating wall has been knocked down, and the two stations have been thrown into one, the platforms now being all numbered consecutively from the South Eastern across to the Brighton side. We are standing at the longest South Eastern platform - No. 2. The combined Victoria is one of the largest stations in London, with a total of 17 platforms and an area of 23 acres. If the fact be taken into account that the Brighton Company, when enlarging their part of the station, were not able to extend crossways, and had to extend lengthways, so that all but two of their nine platforms are really equal to two (and are actually so used, trains running into the inner ends of the platforms without disturbing those in the outer ends), Victoria has the equivalent of 24 platforms. Southern Railway 4-cylinder 4-6-0 locomotive No. 850, “Lord Nelson”. Out of Victoria the rise to the Grosvenor Bridge over the Thames is extremely steep. Brighton trains have to mount an incline of 1 in 64, but we, taking the inside of the curve, have in front of us the even more formidable ascent of 1 in 61. Worse still, it begins right off the end of the platform, so that there is no chance of “taking a run” at it. As I have mentioned previously, it is customary for the engine that brought in the empty coaches to help at the start by giving a friendly push in rear to the top of the bank, but our train is so long as to occupy the full extent of the platform, so that it has been pushed instead of pulled in, and there is therefore no engine at the far end. Realising this, our crew have had the foresight to drop some sand on the rails from the trailing sandboxes of “Lord Nelson” as he was backing down on to the train, to prevent slipping as we get away. At last comes the “Right away!” Looking at the indicator of the valve motion we see that “cut-off” is fixed only at about 40 per cent, and for the start we notice that the regulator handle is not moved right over the quadrant plate. Yet the engine responds grandly. No further than half-open do we see the handle pushed as the engine begins to move, and with an encouraging: “Now come along, my beauty, come along” from the driver to his steed, we advance steadily over the maze of switches and crossings and begin to climb. So with half a regulator and 40 per cent, cut-off - far below the engine’s maximum possibilities - we sail up the incline, slowly and steadily accelerating, and without an atom of slip. We might be almost running “light”, rather than pulling a train of some 470 tons behind us! Half way up the bank we spot Mr. Mackay, taking the fine photograph that heads this article, and give him a friendly hail as we pass. Now we have crossed the Thames, and are passing Battersea Pier Junction. The 1 in 61 is well behind us; we have made a triumphant start indeed. But it will be many miles before we may expect to see anything of the speed capacity of our mount. Almost uninterruptedly for 18 miles we shall climb, and even where there are “breathers” in the ascent, we dare not take advantage of them, as we are sandwiched in between frequent electric trains, using the very metals that we are running over. So we notice that the driver now brings the cut-off of the engine back to 30 per cent, and closes the regulator to about two-fifths of full open, or less. We shall find that these are roughly the “running positions” of regulator and cut-off for most of the journey. We were reminded by the rapid puffing of “Lord Nelson” at the start that the unusual disposition of the cranks of the four cylinders results in eight “beats” to each revolution of the driving wheels, instead of the usual four. The exhaust has now quietened until it is practically inaudible, but we notice the effect of this crank arrangement on the fire, in the beautiful evenness of the blast. The fire-hole door, by the way, is left partly open throughout the trip, to allow of the ingress of plenty of air for the combustion of the fuel. Through Brixton and Herne Hill we are doing about 40 miles an hour. Immediately after this comes the stiff rise to Sydenham Hill, which demands a little more regulator opening. But with barely half regulator, and still at 30 per cent cut-off, we breast 2½ miles at 1 in 100, and are still doing a shade over 30 miles an hour at the top. The regulator is now nearly closed as, with a prolonged blast from the whistle, we enter the smoky mouth of Penge Tunnel. Only those who have travelled on the footplate can realise the extraordinary sensations of passing through a tunnel on the engine. The roar and rattle of the engine itself in the confined space of the tunnel walls; the steam and smoke sweeping past and sucking back into the cab; the glow of the fire lighting up the cab and its occupants, amid the Stygian blackness of the bore; all combine to leave an unforgettable impression on the mind. But we shall probably be glad when we are out once again into the fresh air. This is, by the way, an exceptional route for its tunnels; Penge is 1¼ miles in length; then come Chelsfield and Polhill, before and after passing Knockholt, the latter 1½ miles in length; Sevenoaks Tunnel is all but two miles in length and last of all there are three tunnels between Folkestone and Dover, of which Abbott’s Cliff is 1⅛ miles in length. The tunnels do not fail to leave their “trade marks” on the faces of the travellers in the cab, because tunnels are invariably the dirtiest parts of a footplate journey. Dover Pullman Express passing Bickley. 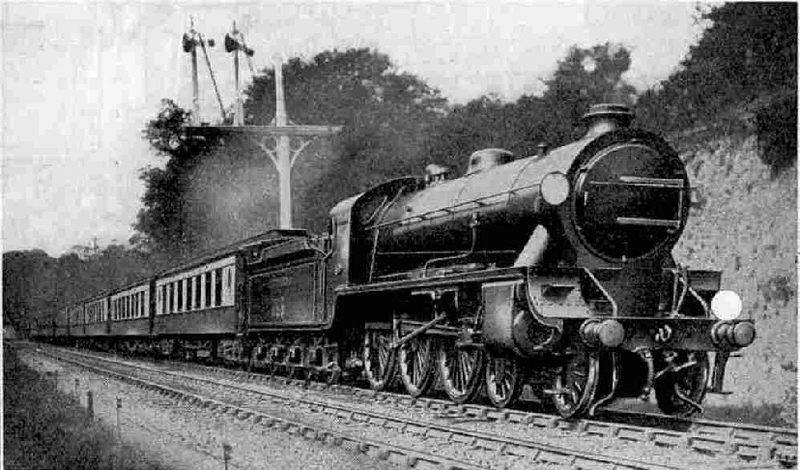 “King Arthur” 4-6-0 No. 769, “Sir Balin”. The regulator is nearly closed for the down-grade through Penge Tunnel and beyond, and as we pass Kent House there is a sharp application of the brakes, to reduce the speed from 55 miles per hour or so to about 40 miles per hour, over the curves between there and Beckenham Junction. Then we rise abruptly and drop to Shortlands, after which the line rises again at 1 in 95 past Bromley to Bickley Junction, where we are braked in order to pass round the spur line to where the main line from Charing Cross is joined at Orpington Junction. Still climbing, on rather less than “half regulator” and 30 per cent cut-off, we breast Orpington, Chelsfield and Knockholt, the last three miles, to a point just south of Knockholt Station, being up at 1 in 120. At last we are at the summit, but this 17½ miles of toilsome ascent from Victoria has taken us 31 minutes. For the remaining distance of just over 60 miles we are to average round about 55 miles an hour. the green warning board indicating engineering works in progress, and the “C” sign, showing where they commence, brings us down to 15 miles an hour at Hildenborough. Shortly after regaining speed we have to slow yet again for the curve through the junction at Tonbridge. Over the first 30½ miles of our journey we have taken 47½ minutes. We have now before us one of the straightest lengths of line in the British Isles, with only the gentlest of undulations, and of this “Lord Nelson” will take the fullest advantage. The driver opens the regulator to one-half, while keeping his cut-off still at 30 per cent. Rapidly we gather speed. Sixty-six miles an hour at Paddock Wood, 69 just beyond, 62½ at Marden, 70½ at Staplehurst, 61½ beyond Headcorn, 67 at Pluckley, 62½ at the top of the rise to Chart Siding, 66 through Ashford Junction and past the lines of engines outside the locomotive works there - these are typical speeds over the ups and downs of this section. So we have covered the 26½ miles from Tonbridge to Ashford, with our 470-ton train, in 26 minutes, despite the necessity of recovering speed after the Tonbridge slack. Another permanent way warning board ahead! It is renewal of track this time, near Smeeth, and once again our proud progress must be stayed until the welcome “T” sign indicates that normal speed maybe resumed. So on past Westen-hanger to Sandling Junction; 66½ miles from Victoria in 85 minutes, and 13 minutes left in which to cover the last 11½ miles. It is easily done; from here to Dover is an unbroken falling grade of 1 in 264. We get up to 66 miles an hour just before Shorncliffe, and then have to be eased down for the curves through Folkestone. The sea bears into sight on our right as we swing over the high viaduct across the centre of the town. On through Folkestone Junction and the tunnel we speed; then through the Warren, with its marked evidences of constant falls of the cliff face, and the trouble and expense that they have given to the railway company. Abbott’s Cliff Tunnel is threaded, and we espy on our right all that remains of the beginning that was once made to bore under the English Channel. At last the peculiar tunnels under Shakespeare’s Cliff are in view, and we take the “left-hand window”, slacken speed to a walking pace over the timber viaduct beyond, as we approach the junction at Dover, and bear round a very sharp curve into the Marine Station at Dover. Yes, we have done it; the time is 12.23 p.m., to the very “tick”. A shunting engine comes and hitches the vans and the two trucks off the rear, carrying them round on to the Quay and we regretfully say goodbye to driver and fireman, who run back to the locomotive depot to get ready for working the 3.30 p.m. boat express back to Victoria. Such is a day in the life of the “Lord Nelson”. You can read more on “The Golden Arrow”, “The Fleche d’Or” and “The Newhaven Boat Express” on this website.